Lying in the lower berth of the Pullman cabin as we beat to windward across the Channel during a cold spring night, I could appreciate the creature comforts offered by a luxury ocean cruiser such as the Discovery 58. I was snugly contained against the leecloth, with the heating pumping out. I could feel the raked stem softly parting the head seas, the lack of pitching gained from having centralised tanks. But the most comforting thought as we traversed the shipping lanes, alive with passing container ships, was the thought of her structure. The 10 tonnes of lead below the 58, the equivalent of having a 45ft Beneteau moulded into the keel, is joined to the hull by 17 keel bolts. There is a Kevlar wrap around the hull waterline for impact resistance, and there are four water-tight bulkheads bonded to both hull and deck. Safe to say that during my two-hour off-watch, I slept rather soundly. And this benefit of feeling rested during a passage is a significant one for bluewater cruisers. If you were to go long-distance cruising, what would be the primary features you would look for in a yacht? I would wager that both looks and reward on the helm might play second fiddle to more practical concerns such as comfort throughout and the ability to access and service systems. Discovery knows this. It has employed a tried and tested formula, putting practicality before fashion, since the launch of its first yacht designed for short-handed cruising in the late 1990s. So while its cruising yachts may seem a little dated, they have a popular niche following, particularly from couples going bluewater sailing. 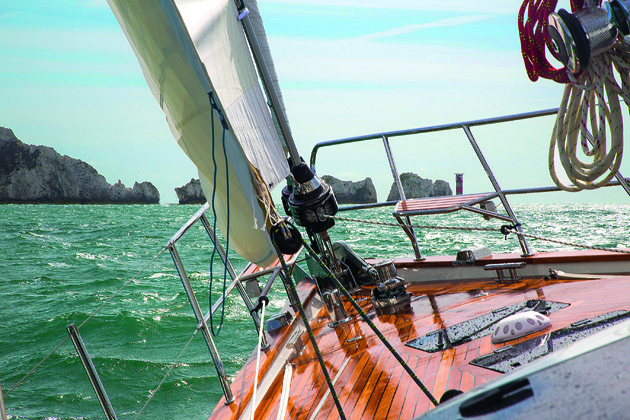 We wanted to find out why this recipe works so well, so we sailed this first new Discovery 58 from the Solent to Jersey in late April to explore in detail the features that go into making the ideal short-handed cruising yacht. 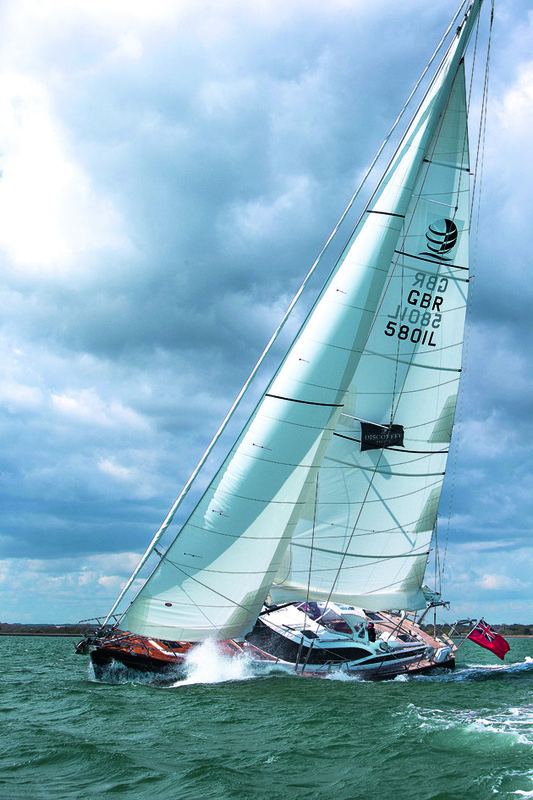 Three years ago, the Marchwood-based company launched the Ron Holland-designed 57 (our full liveaboard test featured in the February 2013 issue). The styling, particularly the bubble-shaped coachroof, met with a mixed reaction, however. So Discovery took the feedback on board and implemented aesthetic and practical changes to that existing hull. The result is now relaunched as the 58. Other than looks, the main differences are the versatile options the Discovery provides. Owners can now choose between either single or twin wheels – the only centre cockpit yacht I believe that has this option – and a fourth cabin instead of a technical room. The appeal of a Discovery yacht lies with its exhaustive specification, luxury build quality and design specifically tailored to suit a cruising couple. John and Caroline Charnley founded the company after unsuccessfully searching for a 50ft yacht to suit their long-term cruising goals. When they realised how much gear they wanted to ship aboard and the space needed to stow it properly, they settled on a 55ft design. Nearly 50 of the Discovery 55s have since been launched, plus a 67, 58 and a 50ft cat. As the Charnleys discovered, the provision of enough stowage and tank space is a key factor for bluewater sailors. So the Discovery 58 can carry 1,300lt of fuel and 1,000lt of water for long-term cruising. Cold storage is generous, with a 300lt fridge and 170lt freezer as standard. I was also impressed with the bottle stowage below the galley sole, plus the tall, deep wardrobes in the cabins. A sail locker is a prized cruising asset. On the Discovery 58 this is vast, yet practical – it lights up when the hatch opens and there are sensibly placed cleats for hanging up spare sheets and halyards. A gas locker and bosun’s locker are recessed below the side decks amidships. To give an idea of depth, the gas locker can house two 6kg propane bottles. Consider that there are deep quarter lockers too and you realise stowage space on deck will never be an issue. The layout of the Discovery 58 is designed to promote rest and prevent exhaustion. There are just three shallow steps from saloon to cockpit, for example. And the company is aware that the constant sound of mechanical noise can be draining, so the engine room is so well insulated it can be difficult to tell when the engine or genset is running. The Discovery is rigged to be as easy to sail from the cockpit as possible. The twin furling headsails and an in-mast furling mainsail are standard. Unusually, the owner of the test boat had opted for a slab-reefed main – which is “against the Discovery ethos of easy cruising,” says Charnley. The choice of two different-sized headsails is arguably the most practical solution for long-distance cruising, and one offered by many yards producing this size of yacht today. The ability to swap sails, or tuck in a couple of reefs without leaving the cockpit is ideal for short-handed sailing. 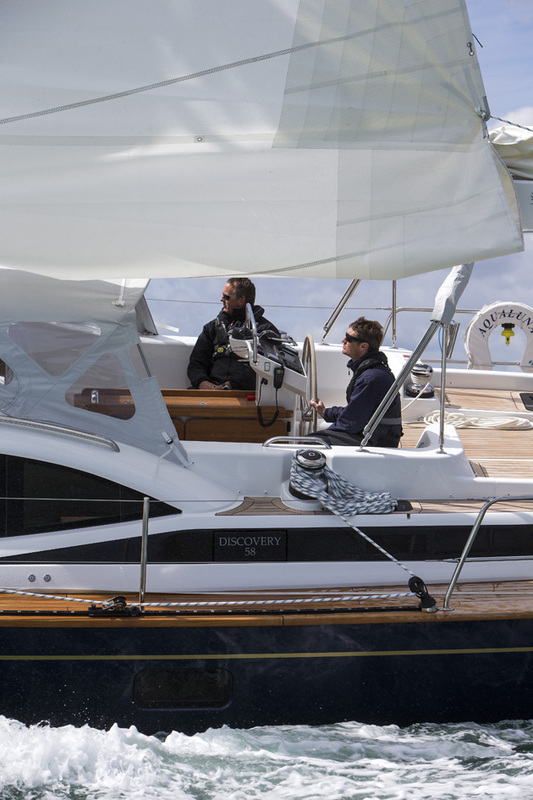 What the Discovery 58 lacks in helming pleasure she makes up for in comfort. She provides a lovely soft motion, whether punching through sharp chop or parting swells. You really notice and appreciate this below decks. Above all, she makes you feel safe, the most important aspect for a couple, especially if caught out in bad weather. During a typically cold UK spring night, where the wind cut straight through regardless of the number of layers we wore, the deep cockpit came into its own. We spent most watches hand-steering, but the more realistic mode is a snug one: engage autopilot, sit by the companionway with sheet controls on electric remote switches, and you have good views both forward and to the plotter at the chart table below. Or there is the option to keep even warmer on watch at the raised navstation. The layout below is a tried and tested one for a centre-cockpit design, with a passageway galley, owner’s stateroom aft and a walk-in engine room. The raised saloon may provide the wow factor, but I found the galley a highlight, a real pleasure to work in. It is light, spacious, yet narrow enough to brace yourself at heel. 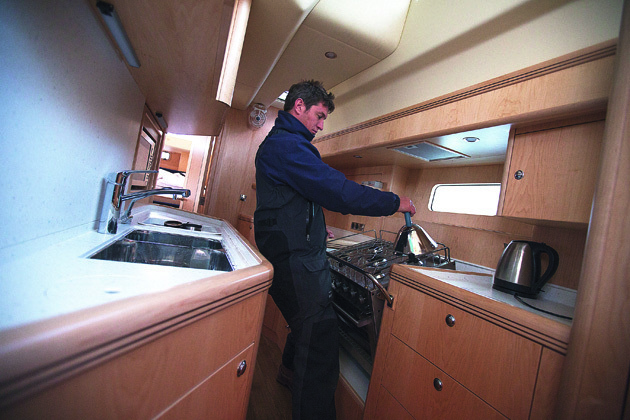 Those things you need to get at regularly are positioned at the forward end, close to the companionway, including a drinks fridge and a sweep-top bin recessed into the worksurface. 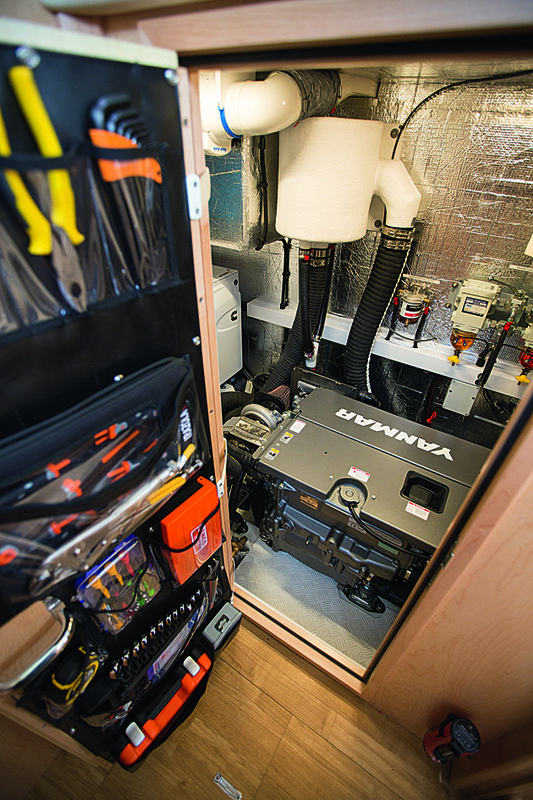 Liveaboards need to prepare three meals a day in the galley, so practical working and stowage space is essential. The Discovery 58 excels here. She has front-opening fridge-freezers that extend out to the hulls and use keel-cooled compressors. There is capacious worksurface with deep fiddles and I liked the generous sinks. The cabins are as comfortable as her premium price would suggest, including the standard luxury mattresses, but it’s the small extra touches that impress. There are numerous plug sockets, the windows all have dual blinds (insect and blackout) and there is plenty of ventilation. The heads include details such as heated towel rails, soap dishes, shaver sockets – there is even dedicated toilet brush stowage. These may sound like inconsequential aspects to some, but in my experience they are anything but. Having wet towels or toilet paper, or nowhere to store essentials quickly becomes frustrating, and can be a considerable annoyance when living aboard for long periods. It is the behind-the-scenes details that Discovery incorporates, however, that that really impress. Lengths are taken to ensure longevity of the fittings. The seacocks, for example, are made from a type of Nylon that guards against corrosion. Likewise, tanks are polyethylene and marine-grade tinned cabling is used for all circuitry. Changing the working tanks over can be a fiddle on many yachts. The 58 has a locker beside the steps to the forward cabins that contains a very neat manifold switchover. It is easy to access and, along with breakers, battery switches and aircon pumps, is clearly labelled. 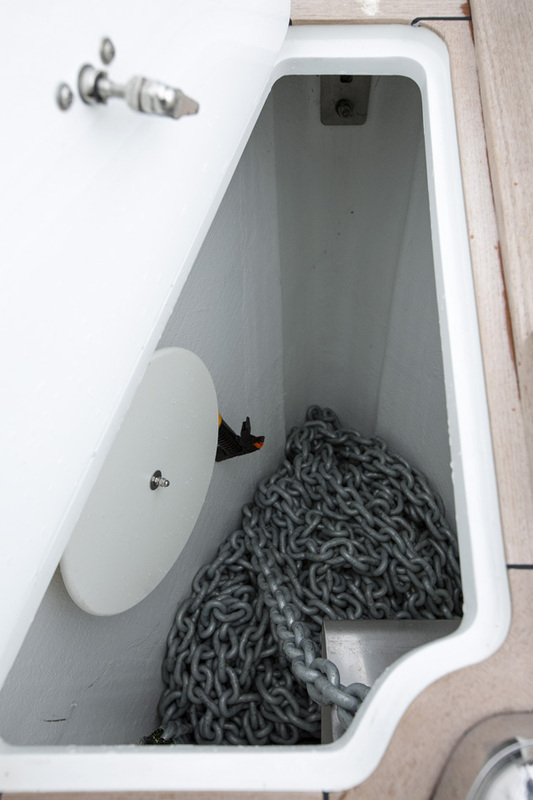 Other details I appreciated are the saltwater anchor wash hose, automatic bilge pumps in the sail locker and the rubber-mounted floorboards for sound insulation. Most yards offer the bare minimum of equipment to keep the base price low. But the danger with buying a boat with scant specs is that she may never be fitted out properly. It could become a job that’s put off until that elusive day. But Discovery takes the opposite approach. The 58 comes with everything you could possibly need and all to a premium standard. Another benefit of this thorough approach is that each item has been properly thought through from the design stage, avoiding the headache of where to try to fit optional extras. The walk-in engine room has a 5kW Northern Lights generator neatly installed. And the path for each duct leading from the standard Eberspacher heater is as carefully considered as the rest of the plumbing runs. Discovery yachts come ready to sail, so the full specification includes navigation instruments (both chartplotter and radar), electric winches and traveller. But there is little point in having such comprehensive kit and stowage space if it is impossible to access it for servicing. John Charnley explained that he had instigated a 15:10 rule at Discovery Yachts. This means that, according to his requirements, it should take only 15 seconds to access every major piece of equipment and ten minutes to remove it (engine excluded). The Discovery is an exceedingly well-finished and comfortable yacht. And as the founder John Charnley says: “Everything aboard is designed to support two people sailing bluewater.” And this model benefits from the feedback of over 50 owners out there doing just that. Stowage is bountiful throughout and the quality of the joiner work exemplary. 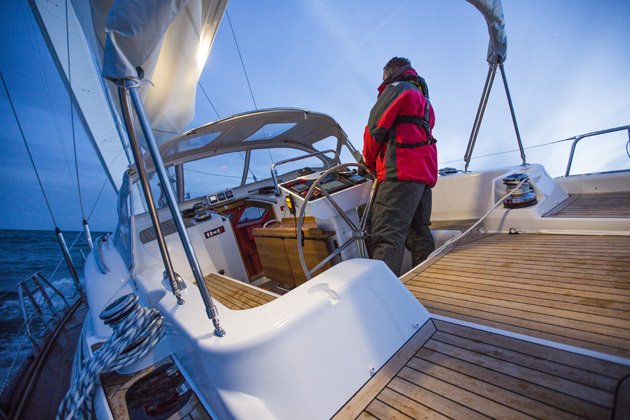 The yard offers a flexible, semi-custom build – the owner of the test boat wanted to visit the yard every month and specified a year-long handover. 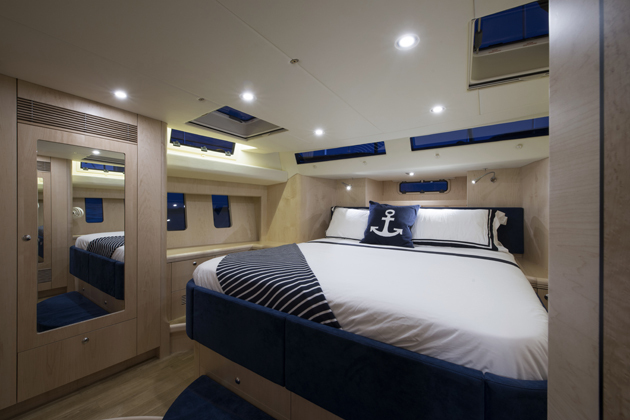 The concept may look and feel a little dated now – the big heavy cruiser that needs a Force 4 to get her moving – but the security the Discovery 58 provides from her build and level of standard fit out, help you sleep well at night. Whether this level of comfort is enough to make up for the lack of reward on the helm is arguable. But if a yacht can be rated on how well rested it delivers its crew, the Discovery is hard to beat. During our photoshoot in the western Solent, we sailed upwind under self-tacking jib and offwind with full genoa, both accompanied by a reefed main. 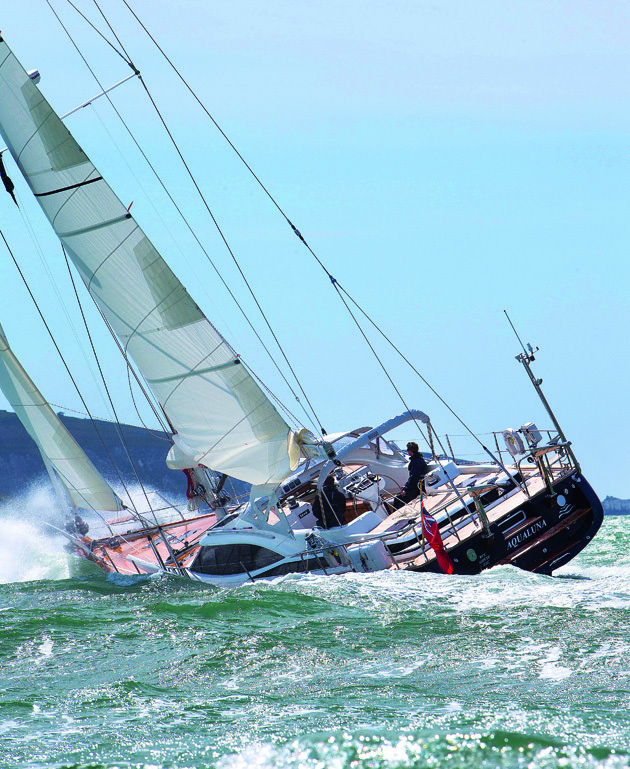 Despite the ideal conditions – a sunny, Force 5 south-westerly – it was not overly enjoyable on the helm, as there is little feedback from the lengthy geared steering linkage. It was difficult to get the yacht into a groove and too easy to wander off course if you didn’t have an eye on the wind gauge, compass or, later, a star. I sailed the twin wheel set-up on the original 57, and initially thought I would prefer to have that royal box-style set-up in the wings, rather than helm from down in the centre circle. You certainly get a better view forward with twin wheels, but on passage, it felt secure to be more central when helming.